I've briefly mentioned before that Filler is one of my favourite podcasts of the moment. 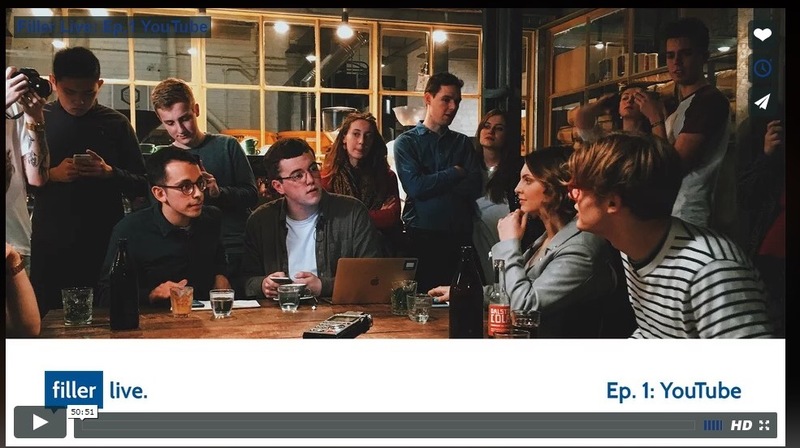 It's a podcast in which Harry Hitchens and Matt Shore interview people currently working in the creative industries about what it's like, what it takes, and how it's affected their lives. 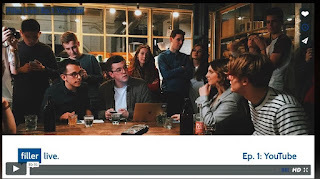 They've had such an incredible range of people on the show and, although I'm not necessarily interested myself in some of the parts of the industry some of their interviewees belong to, the podcast never fails to be incredibly insightful and interesting. Filler has only been running for a year if I remember rightly and, to celebrate the end of their second season, they filmed a live version with an audience interviewing Estee Lalonde, Bertie Gilbert and Charly Cox. I watched it last weekend and thought it was such a great episode. I've watched and loved Estee's videos for a long time but hadn't known much about Bertie Gilbert or Charly Cox before listening to the podcast. Bertie is a YouTube filmmaker and Charly is a producer/blogger/seemingly a very long list of amazing things. They have all worked on YouTube (which was the common theme for this live episode) and are all incredibly young, incredibly successful and hugely inspiring. But, apart from those things, they are three highly diverse creatives doing different things and with a great breadth of experiences between them. Because of this, I thought the format of Matt and Harry interviewing them all at the same time worked so well as each of them had something new and original to add to the discussion. As a young person who still only vaguely knows what industry I would like to go into in just two and a bit years, I am so grateful that podcasts like this and people like this exist to inspire me. They discuss this on the show and I've discussed it myself after attending BeautyChat LIVE, but aspects of the the working world are changing beyond recognition almost every year now and I find it so exciting that projects like Filler allow us to gain a glance into what's changing and how. To think that Estee, Bertie, Charly as well as Matt and Harry themselves are so young and doing such exciting things really inspires me. While I know a career in the creative industries can't be at all easy, it's nice to see people that are working hard but doing well for it. For the most part, it's become the norm for the majority of teens to go to university before attempting to make their way in the world of work (myself being a classic example of this), so I can't tell you how refreshing it is to see different ways of creating a successful career for yourself, both in taking the traditional route and not so much. I think it's so important to widen our horizons and gain new perspectives every once in a while and Filler has definitely helped me to do this. I'd recommend it to anyone who is even vaguely interested in the development of the creative industries and YouTube as a phenomenon. You can listen to the audio of Filler Live for free on the link at the top of this post or you can pay to watch it here. I would personally really urge you to watch this one rather than listen if you're willing to pay the £3 for it as it's beautifully filmed and Harry and Matt have clearly worked so hard on it, funding Filler Live out of their own pockets. Last week I received a belated birthday card and present from one of my oldest and closest friends. Over the past six years she's grown more than anyone I've ever met in my life and it's been such an honour to watch her blossom into the person she's always wanted to be. She never fails to be there when I need her no matter how busy her life has become because of all the amazing opportunities she's created for herself and rightly fought for. This I know from hundreds of occasions when she has dropped everything to make time for me when I've needed her, most recently in November when I needed a weekend to escape from everything. It's never even been a question for her - when I need her the answer is always yes. Knowing how I'd been feeling the last time I saw her, she wrote in the card "your time is expensive, so don't let people who don't deserve it to spend it for you". A week later, I'm still thinking about those words and how true they are. It's hard today to discern who is worth your time and who isn't, be it at school, university, home or work. Instagram, Twitter and Facebook have led us to feel the pressure more and more to be liked. I've especially felt this since starting university, at the start of the year I'd somehow got it into my head that it was important to be friends with everyone and for everyone to like me. But that was so unrealistic and, more than that, it was completely the wrong attitude to have. If you go around thinking that everyone has to like you and that you have to be friends with everyone, you'll quickly find yourself unhappy. We're human and we all have such different personalities, it's inevitable that you'll click with some people and others you just won't. That doesn't mean you dislike them or they dislike you, it simply means they're not your kind of people. We aren't compatible with some people romantically and the same goes when it comes to friendships. But spending your time with people who you don't feel comfortable around will end up weighing you down and giving your self-confidence a knock. And that's just not worth it if you're not getting anything out of the friendship - a friendship has to be a two-way street, just like any healthy relationship. They say you're the product of the five people you spend the most time with. Isn't that crazy?! It sounds it at first, but I've seen it in myself. I've seen myself change depending on who I've spent my time with, either becoming a version of myself I love or other versions that I just don't recognise. And it's scary when the latter happens. Choosing who to invest your time in is not only investing time in those people, but also yourself in ways I'd never realised before. But now I know. And I hope you do too. If you're not feeling happy around the people you're spending your time with, give yourself some space and you will naturally gravitate towards the ones who truly deserve your time. At least that's what I've found. Above all I think we should remember that our time is expensive, it's worth a lot and it's important to reflect on who we're letting spend it. Have a lovely weekend everyone - here's hoping the sun stays out as it has been in Exeter this week! 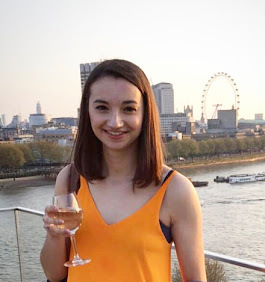 Only when I sat down to write this post did I realise that the last time I wrote a happy list was back in April, so it's definitely time I write another! I've got a ton of essay deadlines at the moment which is feeling a little overwhelming and I find it helpful when I've got a lot going on to take time to step back for a bit and appreciate what's making me happy despite the multitude of things I feel I have to get done. I also a few weeks ago listened to the Jess Lively podcast with Alisa Vitti on pleasure, and the difference trying to make everything you do contain a tiny bit more pleasure can make. When listening to the podcast I found myself nodding along throughout as Alisa spoke about how much nicer we can make even the most arduous tasks if we take the time to do something that can make them a little more enjoyable. In my own life since listening to the podcast I've been trying to cultivate this and whether it's listening to a great podcast to concentrate on while I do the washing up or making myself a cup of tea and having a bowl of fresh fruit while I do some history reading, it's making those tasks that bit easier. Definitely an episode to listen to if you're interested! 1 // Podcasts - I can't remember exactly when I first started listening to podcasts but I think it was less than a year ago for sure. All I can tell you is that I am a complete convert. Like I said, whenever I'm washing up, doing tasks where I don't have to think or walking somewhere on my own, podcasts are my favourite thing. I love listening to music too but sometimes I'm in the mood to listen to something informative and some of the podcasts I listen to are so interesting - they're great if you want to zone out but zone in to something else that will hold your attention if that makes sense. I'm going to dedicate a post to all the ones I listen to and love in a post sometime soon but I'll mention here BBC Radio 4 Woman's Hour, Filler and Dear Hank & John as the ones I'm enjoying the most right now. 2 // Yoga - I'm a recent convert to yoga and, having been subscribed to Yoga with Adriene for over a year, finally found the motivation to start watching her videos and trying yoga with her thirty days of yoga camp that started in the new year. It seems like everyone and their dog has been raving about Adriene and her channel and it's for good reason. Her videos are great and I can't tell you how relaxing I'm finding it to dedicate some time to yoga whenever I can. I've got three episodes left in the thirty days camp and am so grateful I started making time for it. It's true what they say - yoga is incredible for both the body and mind. 3 // Little treats - Since I've been feeling a little down and like my life is pretty monotonous lately I've tried to make the effort to treat myself a bit more (as I think we all should do!). For some reason I again decided this year to give up chocolate for Lent so heartbreakingly that's not been an option. It's probably a good thing because instead I've been spending my student loan on fresh fruit snacks of strawberries and raspberries which make essay planning a slightly less wearing task... although only slightly because not even my favourite fruit can make essay planning fun. 4 // Reading a really great book - I'm currently reading The Opposite of Loneliness by Marina Keegan which is a book of short stories and essays written by Yale graduate Keegan before she was sadly killed in a car accident. I've read mixed reviews of this book but I personally am enjoying it more than I think I've ever enjoyed or been gripped by short stories. In my opinion she writes captivatingly and I'm really glad I picked this up. There's nothing like a good book to get lost in to cheer me up. 5 // Discovering new tv series - After reading Laura's fabulous post about the Netflix original series 'Love' I quickly opened up Netflix and gave the first episode a watch. I can see exactly what Laura's talking about, while it can be frustrating at times to watch, it's a series that feels very real and current, unlike anything that I've watched in a very long time. I also of course can't talk about new tv series without talking about the release of the new series of House of Cards which I am essentially devouring in the moments I can spare between writing essays. Netflix series make for an excellent escape from your to do list, don't you find? That's all from me today, happy Friday everyone and I hope you have a great weekend. Let me know what's on your happy list at the moment if you fancy it! Happy March! It completely baffles me that we're already into the third month of 2016, hasn't the new year only just started?! But, while it baffles me, I've been ready for spring for a while now so here's hoping the sun puts his hat on a little more and this gloomy winter waves goodbye. I was lucky enough to be sent a bound proof of Your Heart is a Muscle the Size of a Fist by Sunil Yapa in January and have only just got around to finishing it - the perks of having so much uni reading! - but I absolutely loved it and thought it was an incredible debut from Yapa so wanted to share some of my thoughts here. "A heart-stopping debut about protest and riot ...1999. Victor, homeless after a family tragedy, finds himself pounding the streets of Seattle with little meaning or purpose. He is the estranged son of the police chief of the city, and today his father is in charge of one of the largest protests in the history of Western democracy. But in a matter of hours reality will become a nightmare. Hordes of protesters - from all sections of society - will test the patience of the city's police force, and lives will be altered forever." Your Heart is a Muscle the Size of a Fist is set over one day in history; the 1999 Seattle World Trade Organisation protests. In November 1999 an estimated crowd of 40,000 people protested globalization, preventing delegates from reaching the convention centre where world trade deals were set to take place. The police were eventually overwhelmed by protesters and what followed was known as one of the most violent cases of police and public brutality at a US protest. "A thousand voices joined in rhythm. It was a primal sound, a roar like a waterfall, a thousand voices becoming for the briefest of moments one voice, one roar, threaded through with frustration and yearning, their desperation to break through to another place. One where the city beloned to them and they had no reason to be afraid." "The human survival mechanism: to say your prayers, thank your gods, and hold your breath when you passed the slums. The sweet poison of privilege, wasn't it? To think blindness a preferable condition. And yet, there they were whether you wanted to see or not. The unwanted of the world." "She began to walk towards that ring of men who were grunting and growling like dogs on a deer. Because how do you stop a pack of men who have been wounded in the fight, who have scented blood on their adversary and are closing in for the kill? How do you stop a pack of dogs who have lost their minds in fear and rage? You remember that they are not dogs, but men. Frightened and angry human beings." It seems odd at first glance to think that a story which takes place over just one day could fill a three hundred page book. But Yapa executes it beautifully. He tells the story from a range of characters' perspectives, which is something I absolutely love in fiction and have only seen done so effectively by Jodi Picoult. The fact that you have an insight into so many perspectives, from the police to the protesters to a delegate, shows you what a protest truly is from all sides and allows Yapa to highlight the state of our world both then and now. To be perfectly honest, much of what I read reminded me of news stories we still read today. Of police brutality and racism and the right to protest - these things have only been re-emerging in recent years from what I've seen. But what I love most about this book are the subtleties Yapa includes. It's not only a story about protest and globalization; at its root it's a story about a father and son's relationship, an outsider striving to make the world better and young people beginning to understand what the world is really like. 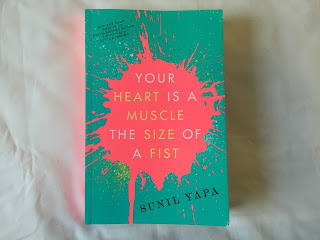 This was such an incredible debut, I can't wait to see what Yapa writes next.